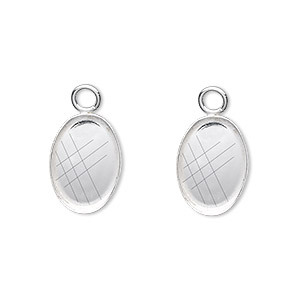 Ear wire, Almost Instant Jewelry®, silver-plated brass, 28x14mm fishhook with 12mm cushion setting, 20 gauge. Sold per pkg of 2 pairs. 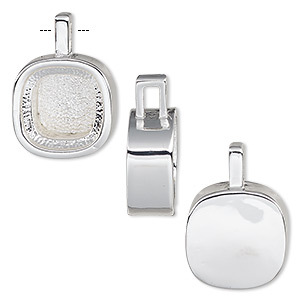 Drop, Almost Instant Jewelry®, silver-finished "pewter" (zinc-based alloy), 14mm square with 12mm cushion setting. Sold per pkg of 2. 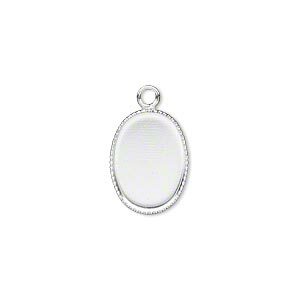 Pendant, sterling silver, 25x18mm oval setting. Sold individually. 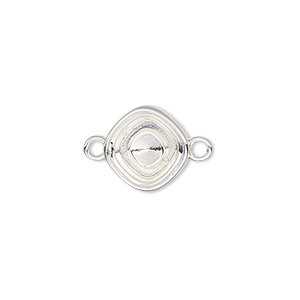 Pendant, Almost Instant Jewelry®, silver-plated "pewter" (zinc-based alloy), 25x19mm single-sided round with 14mm rivoli setting and tube bail. Sold individually. 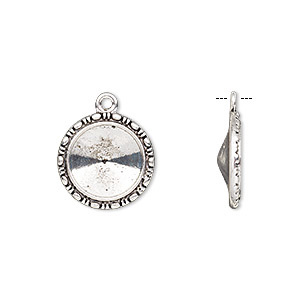 Pendant, Almost Instant Jewelry®, silver-plated "pewter" (zinc-based alloy), 21x16mm single-sided round with 12mm rivoli setting and tube bail. Sold individually. 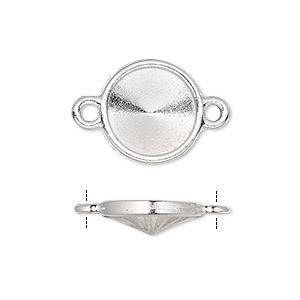 Drop, silver-plated brass, 15x11mm oval with beaded edge and 14x10mm oval bezel cup setting. Sold per pkg of 6. 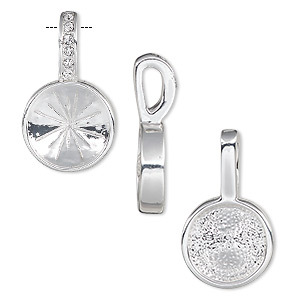 Link, Almost Instant Jewelry®, silver-finished "pewter" (zinc-based alloy), 13mm diamond with 10mm cushion setting. Sold per pkg of 2. Bracelet, Almost Instant Jewelry®, cuff, silver-plated brass and "pewter" (zinc-based alloy), 65x36mm with 30mm round setting, adjustable. Sold individually. 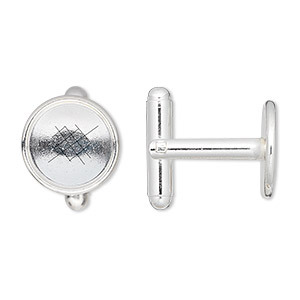 Cuff link, silver-plated brass, 12mm round bezel setting. Sold per pkg of 2 pairs. 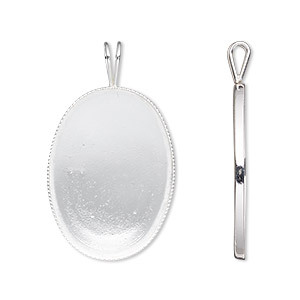 Drop, silver-plated brass, 19x14mm oval with beaded edge and 18x13mm oval bezel cup setting. Sold per pkg of 6. 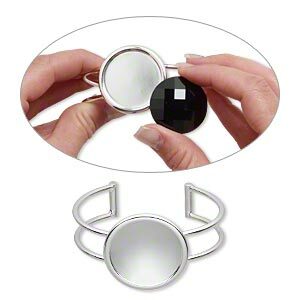 Drop, silver-plated brass, 21mm round with beaded edge and 20mm round bezel cup setting. Sold per pkg of 2. 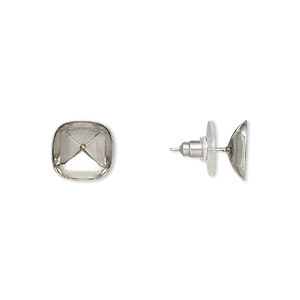 Earstud, Almost Instant Jewelry®, stainless steel, 13x13mm with 12x12mm classical cushion setting. Sold per pkg of 2 pairs. 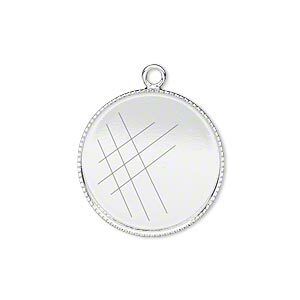 Drop, Almost Instant Jewelry®, silver-plated "pewter" (zinc-based alloy), 17x9mm marquise with 15x7mm navette setting. Sold per pkg of 2. Link, Almost Instant Jewelry® and TierraCast®, rhodium-plated pewter (tin-based alloy), 15mm round with 12mm rivoli setting. Sold individually. 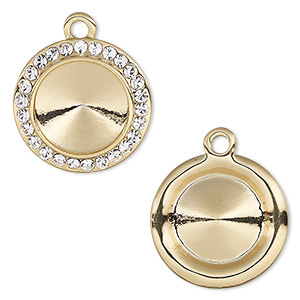 Pendant, Almost Instant Jewelry®, gold-plated "pewter" (zinc-based alloy), 25x19mm single-sided round with 14mm rivoli setting and tube bail. Sold individually. 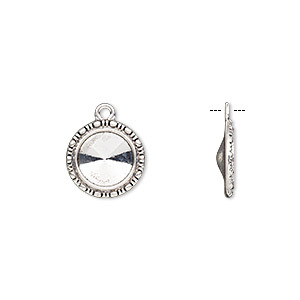 Drop, Almost Instant Jewelry®, antique silver-finished "pewter" (zinc-based alloy), 17mm round with rope design and 12mm rivoli setting. Sold per pkg of 6. 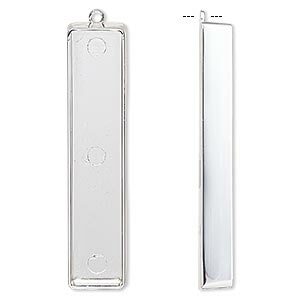 Focal, silver-plated "pewter" (zinc-based alloy), 56x13mm rectangle with 54x11mm non-calibrated rectangle setting. Sold individually. 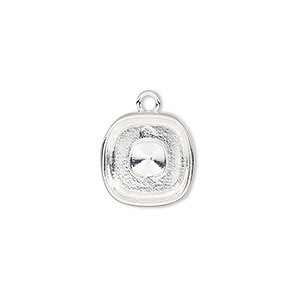 Pendant, Almost Instant Jewelry®, Swarovski® crystals and silver-plated "pewter" (zinc-based alloy), crystal clear, 24.5x14mm single-sided round with 12mm rivoli setting. Sold individually. 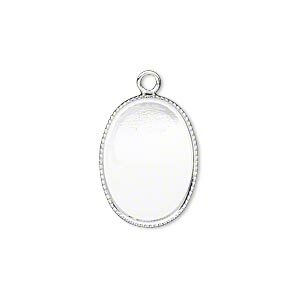 Drop, Almost Instant Jewelry®, antique silver-finished "pewter" (zinc-based alloy), 19mm round with rope design and 14mm rivoli setting. Sold per pkg of 6. 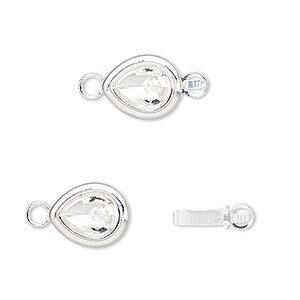 Clasp, Almost Instant Jewelry®, tab, silver-plated brass, 12x10mm teardrop with 8x6mm pear setting. Sold per pkg of 4. 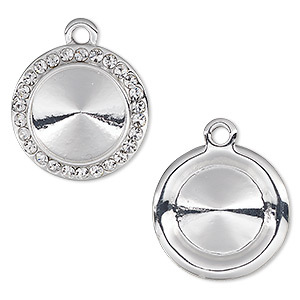 Drop, Almost Instant Jewelry®, silver-plated "pewter" (zinc-based alloy), 15mm rounded square with 12x12mm cushion setting. Sold individually. 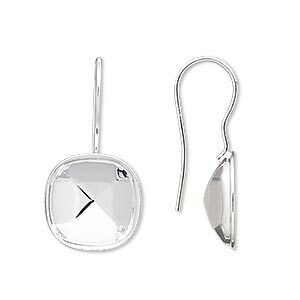 Drop, Almost Instant Jewelry®, Swarovski® crystals and silver-plated "pewter" (zinc-based alloy), crystal clear, 18.5mm round with 14mm rivoli setting. Sold individually. 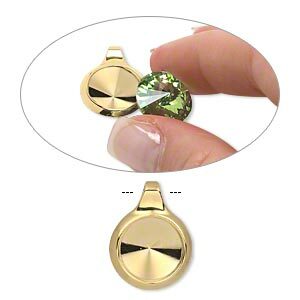 Drop, Almost Instant Jewelry®, Swarovski® crystals and gold-finished "pewter" (zinc-based alloy), crystal clear, 18.5mm round with 14mm rivoli setting. Sold individually.